I recently returned from a solo winter camping trip. My main reason for going was to test some new gear — a new Snowtrekker Basecamp tent and the Muskrat Metalworks Ranger wood stove. I also went because my nine-year-old daughter told me to. I’ve done a lot of media appearances lately promoting the joys of winter camping and Kyla reminded me to practice what I preach. I’m glad I took her advice. It was an amazing trip, complete with a wolf sighting and a couple of snowshoe hares mating just outside my tent. If you haven’t given “hot tenting” a try, then you’re really missing out on spending quality time in the winter woods. I’ve tried sleeping in a four-season tent, a tent-hammock and even a quinzee. Those methods are all possible, but I find I end up enduring the cold nights rather than enjoying them. Using a canvas prospector-style wall tent — equipped with a wood stove — changes all that. The only disadvantage is weight and bulk. A homemade pull-sled or a freight toboggan helps with the weight issue and new tent designs are getting lighter all the time. My favourite hot-tent design is Snowtrekker. These are one of the lightest and best designs out there. For a few years now I’ve used the 3-Person Expedition Shortwall tent from Snowtrekker. It’s 2.7 m x 3.4 m and weighs 10 kilograms. Recently, however, I picked up a smaller model — 2-Person Expedition Basecamp. This tent allows me to go solo (or with a friend) but lightens the load more than with the Shortwall design. The Basecamp has the same footprint as the 2-Person Shortwall tent; but it’s 15 cm taller, giving you much-needed headroom and sleeping room. This bonus doesn’t seem like much but after trying the tent out on my latest trip, I much prefer the design to the Shortwall. It also weights a few pounds less. The smaller tent also takes a smaller stove. This season I’m trying out a new brand stove that was recommended to me by a number of seasoned winter campers. It’s the Ranger by Muskrat Metalworks. 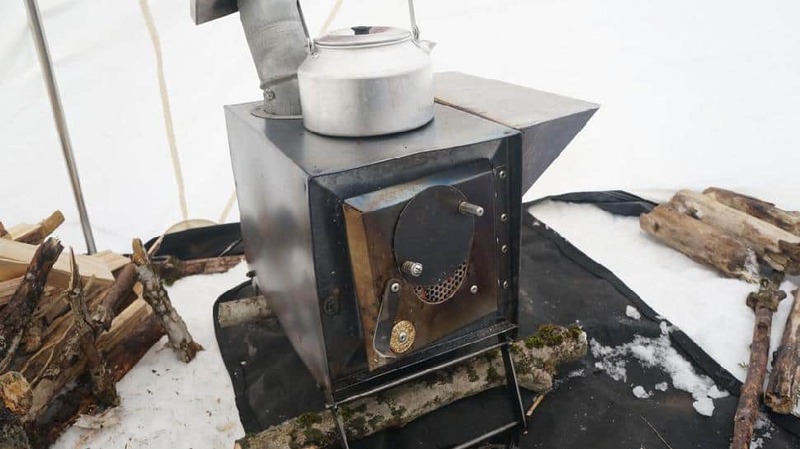 This is one small stove, taking up only 23 cm of cargo space, which allows it to fit sideways on my toboggan. Of course, the size can be a disadvantage. You end up having to cut the wood into smaller pieces. Also, if temperatures are going to be -30 to -40 degrees Celsius, you’d have to burn a lot of wood. But for normal (cold) temperatures of -10 to -20 degrees Celsius, the stove works out fine. The Ranger comes with custom-designed legs to support the stove above the snow, and a slide tray to place your pots and pans on. The total weight is three kilograms, with a height of 38 cm. The chimney consists of five sections of three-inch diameter pipe that stacks together for convenient storage. However, one of the biggest benefits this stove has is that the front draft doubles as a fire-observation window. It’s the closest you’re going to get to a glass front window on a camp woodstove — and it’s my favourite feature of the stove.